You must be 50 years of age or older by December 31 of the year you participate. You must live in the state of Alabama. You do not have to be a member of a senior center or recreation program. You can join as an individual or a group. If you are interested in participating, please contact a representative in your area. Contact information is provided below. 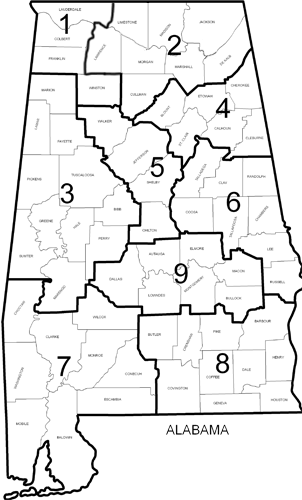 Masters Games of Alabama is divided into nine districts. It is run by a volunteer board of directors (an all volunteer organization) who sees the need to "give back" to the generation that has given so much to us. Our organization encourages seniors to get out and get active. It gives seniors a goal, something to strive for and something to look forward to. It brings needed fun, recreation and activity into their lives. Click on your county in the map at right to find more information about your District. Click on the button below to see info about our Board Officers and Members At Large.